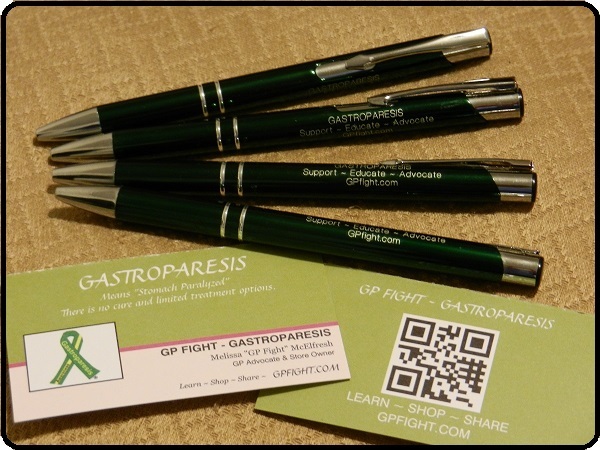 Can a pen spread gastroparesis awareness? You bet! The GP Fight Store has NEW pens. Why are we so happy about this? Because everybody needs a pen at some point in the day (technology has eliminated the pen – not just yet) AND it will spread awareness (if the person reads the pen – haha). If you have ever purchased pens from The GP Fight Store, these are completely different. New style, new green color, new slogan and now with blue ink. These pens were offered to us at 1/4 the regular retail price, so we were able to pass the savings onto you. Once we run out, we may not be able to get more — so hurry! Available at GPfight.com (Store tab – Shop Now) the pens will come in a 4-pack for $5.50. Pair these up with the ever popular GP Awareness Cards for an unstoppable duo. The GP cards now are available in both styles (folded and classic) we have had since we opened the store (few updates have been done). We are happy to announce that the “GP Fight” store has been stocked with more items and is up and running for business! Check it out at: www.GPfight.bigcartel.com. Item costs are as low as we can posiably make them. This was our main goal in creating this store for you! 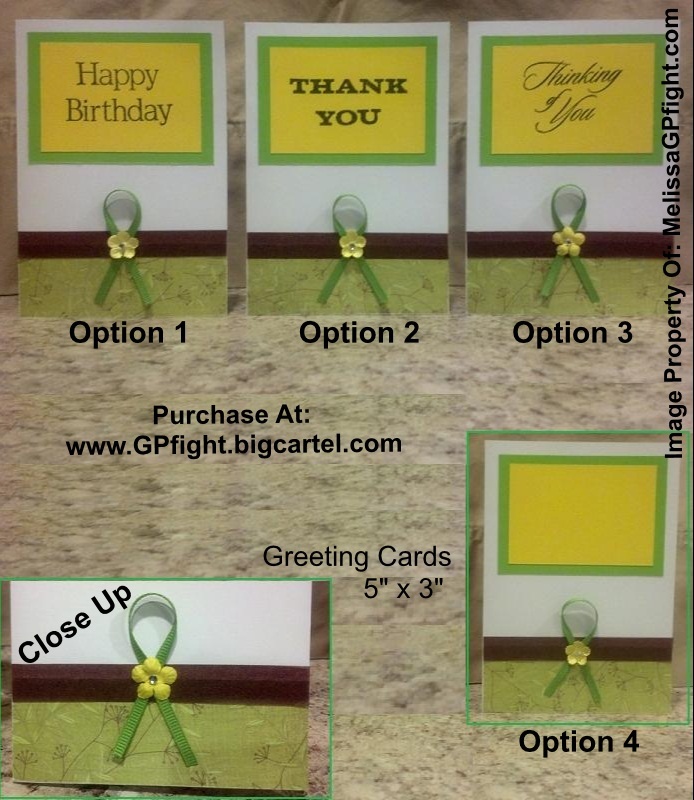 To make sure that you would be able to afford something to spread GP Awareness. And we know how hard it is to wait for something to be mailed to you when you place an on-line order! For that reason we work hard to get your orders assembled and shipped within 1 – 3 business days. If there is something that you do not see or we don’t have enough in stock to fill your wish, e-mail us via our store link and we will see what we can do for you! This store just launched a few weeks ago and is in the process of adding items. In the next few weeks the t-shirts will be stocked and key chains will be in. Several more items are in the design process! The best part of the store is that the goal is to keep the prices as LOW as possible so that everybody can pick up a little something to spread Gastroparesis Awareness in their own way. Items are shipped within 1 – 3 business days and most orders come with a tracking number. Are you sick at the same time every month with your gastroparesis? IT MUST BE CLOSE TO THE 20TH OF THE MONTH. This is my saying and warning to my husband before we plan anything. Have you ever noticed that you are sick (with gastroparesis) more so during a specific time every month? If not, you may want to do a chart/journal. No, I am not talking about the female thing (but I will below). This is GP related. Always about the 20th of the month all of my GP symptoms go crazy. Intense everything: nausea, pain, irritability, headache, fatigue, depression and that ever expanding stomach to where my clothes don’t fit and when they do they bug the heck out of me! It is also around the 20th that my hormones will change. I deeply feel that there is a link between Gastroparesis and hormones. Yet, I have not found good enough proof to share with you all and all of my Dr’s to this point think that there ‘could be’ a link, but they can’t say for sure. Ugg!! On days like this I want to see more education, funding, trials and awareness for gastroparesis so that we can all get better!! WARNING: This section is for the lady’s …..
For many years I got violently ill during that time of the month for me and would change my birth control pills thinking it was that. For about 12 years that I was on them, I tried over a dozen types (different doses, types of hormones, ect). They never seemed to work but a month or two. I was getting to tired of this and felt my body didn’t want birth control pills, so if I stopped taking them, I would get better. That was a very wrong thought too. After being diagnosed with gastroparesis, I figured I would end the birth control thing and get a procedure done, since my husband and I agreed on no children. It was my idea to get the procedure and not him, so that maybe I would feel better (always had painful periods that would lay me in bed for 2 days). It was quick and easy. I do not regret the decision. But, it didn’t change my life as much as I had hoped. Come to find out, I still get very sick during the same time every month (with or without a period). It was never the birth control pills. It is actually my hormones and how it effect gastroparesis. So what can we do about it? Very good question. But my primary care doctor and my GI do not want to touch this one! I know that there are tests we can take to monitor the hormone levels and a cream that we can put on to get enough of a dose to regulate the body. My insurance company will not cover it, it is way too expensive for me to pay out of pocket and we do not have a place in this small town to have this done. My last thought is of supplements. Soon I will go down that road and see what I can do to myself! It needs to be in a block of time that it is okay if I relapse and get very sick. This all must be planned out before I make myself a guinea pig (again).